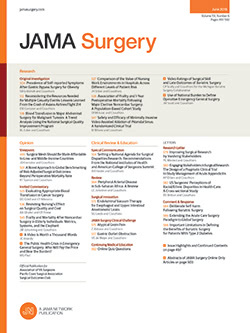 In Reply We thank Tokar and colleagues for their insightful comments regarding our Viewpoint1 and JAMA Surgery for the opportunity to clarify and expand on the important topics of patient safety and the appropriate use of gastrointestinal endoscopy. Tokar and colleagues have done an excellent job of summarizing the current dilemma regarding endoscopic retrograde cholangiopancreatography (ERCP)–related infections in their recent piece.2 For the many patients who require ERCP, it is a potentially lifesaving procedure, and we in no way wish to diminish its critical importance. However, we stress the need for clinicians to ask 2 critical questions when considering ERCP for patients: (1) Does the patient require an ERCP? If so, then (2) does my institution have the capability to reliably and safely complete an ERCP? These questions are essential and independent of the risk of ERCP-related infections, but the recent “outbreak” should be a warning to those who may not have asked these questions in the past. Unfortunately, for practitioners requesting ERCP in the United States, where a gastrointestinal endoscopy quality registry is not required and the data are not publically reported, the answers to these questions frequently cannot be answered.